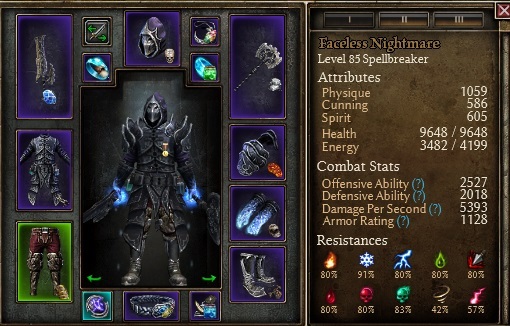 After many many deaths, more than 1,000 hours and more changes than the developers have put into Grim Dawn (heh, heh) I believe that I've mostly fine tuned my 'glass canon' spellbreaker. I only really need 2 words to summarize this build: Glass Canon. For months, I've been struggling to find a balance between damage and survivability. 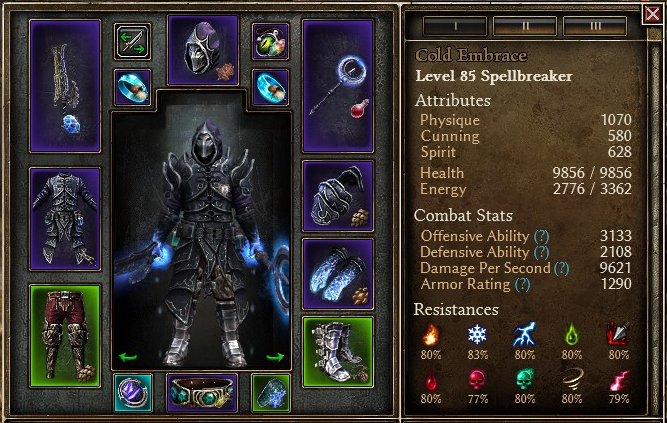 I sought to achieve an acceptable outcome through devotions,items,skills and even stat distributions. The last straw was when my character just felt softer than a block of tofu even with close to 20% lifesteal on mobs + An Avatar of Mercy item and then died as a level 85. It was then that I decided to fully embrace this inherently dangerous side of a nightblade by drastically upping cold damage and taking the most destructive devotions I could think of without much regard for survivability....which turned out to be a most fruitful gamble. - Whirlpool (From Levianthan devotion) and Elemental Storm (From Rhowan's Crown Devotion)- For maximum AoE killing power. Plus it cool watching the storm rip apart mobs while the whirlpool keeps them in. - Play as an exclusively hit and run character. Always make sure there is space to backpeddle. - blade barrier should only be used if mirror is on cooldown. - Do your best to avoid fighting big trolls. They can often one hit kill you. Fight carefully if you must. Last edited by JY_626; 04-09-2017 at 01:16 PM. Sadly I couldn't differentiate it much gear-wise. I mean, it still looks like most Nightblades out there aesthetically, but the playstyle is pretty different. Thinking of grabbing some points from anatomy of murder or maxing out inner focus if I can. You can certainly start with inner focus. Not a bad investment at all. Waiting for the rest of my items. Am one point short of maxing it out. Last edited by Dikkiedik; 04-09-2017 at 06:32 PM. There's definitely a lot more optimization you could do for a DM Breaker.